Fridaymarks the beginning of a somber time of year for NASA, commemorating the firstof three spaceflight disasters that have claimed the lives of 17 astronauts overthe last 40 years. Saturdayalso marks the 20th anniversary of the space shuttle Challengeraccident. The orbiter was destroyed 73 seconds after liftoff on Jan. 28, 1986when rocket booster seal failed, leading to a subsequent fireball and thedeaths of all seven astronauts aboard - including Christa McAuliffe, the firstschool teacher to launch spaceward. NASA willalso honor the seven STS-107 shuttle astronauts lost in the 2003 Columbia accident next week.The Columbia orbiter broke apart during reentry on Feb. 1, 2003 after asuccessful 16-day science mission. Wingdamage sustained during launch by a chunk of fuel tank insulation was latercited as the accident cause. "This is atime to think about those kinds of losses," NASA chief Michael Griffin said in anews conference last week. "Spaceflight is the most technically challengingthings nations do...it is difficult, it is dangerous and it is expensive, giventhe technology we have today." NASA heldan agency-wide Day of Remembrance on Jan. 26 for all three accidents. Each fatalaccident grounded NASA spacecraft as the agency rooted out their causes anddealt out new safety plans before again launching astronauts into space. Ittook more than two years following both the Challenger and Columbia accident beforeNASA launched another shuttle - most recently with last year's STS-114 flight aboard Discoveryon a test flight which proved that still morework was needed to prevent fuel tank debris at liftoff. "We've gotto pay attention to the past so that we don't repeat it," Lindsey said. Lindsey'sSTS-121 mission, currently set to launch no early than May 3, will mark NASA'ssecond shuttle flight since the Columbia disaster and complete a series testsdesigned to increase shuttle safety. AstronautsGus Grissom, Ed White and Roger Chaffee died aboard Apollo 1 in 1967 during aroutine training test overseen by flight controllers. 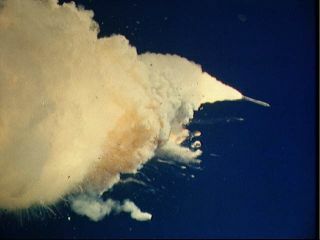 But the 1986 loss ofChallenger and its crew occurred on national television and in full view ofspectators who turned out for the launch. "When youlook back at all these accident anniversaries coming within a few days of eachother, they've had a cumulative effect that suggests how important awell-designed crew carrying vehicle is," said John Logsdon, director of theSpace Policy Institute at George Washington University in Washington, D.C., ina telephone interview. "The point that's been made over and over again is thatthe shuttle will always be an experimental vehicle." NASA firstlearned that lesson after the Challenger accident, but then hadto relearn it after the loss of Columbia, Logsdon said. The agencyis now developing a new capsule-based spacecraft--the Crew ExplorationVehicle--to launch atop a shuttlebooster-derived rocket. A separate cargolauncher is expected to carry heavy payloads into orbit. "Itunfortunately took two shuttle accidents to get NASA away from its dependenceon the shuttle for future human transportation," said Logsdon, who also servedon the investigation board following the Columbia accident. On Feb. 1,2003, Columbia's seven STS-107 astronautshad already accomplished a whirlwindscience mission that kept them working in round-the-clock shifts whentragedy struck during reentry. STS-107 commander Rick Husband, pilot WilliamMcCool and mission specialists Kalpana Chawla, Laurel Clark, David Brown,payload commander Michael Anderson and payload specialist Ilan Ramon--Israel'sfirst astronaut--were lost in the accident. "There'snot a day that goes by that I don't think about the Columbia crew," Lindseysaid. TheChallenger and Columbia accidents were devastating losses and the lessonslearned from them--both mechanically and culturally--cameat great cost, said Tony Ceccacci, who served as an ascent and reentry flightcontroller during Challenger's ill-fated final flight and is now lead shuttleflight director for NASA's STS-121 mission. "Even afterChallenger, I was never afraid to step up in a meeting," Ceccacci told SPACE.com. "But you can see now that people understand that there's a lot more urgency." "There'sbeen a perception for as long as I've been in the program until this recentaccident that spaceflight's routine, that's the public perception," saidLindsey, who joined NASA's astronaut corps in 1995. "It wasn't until I camehere and started getting involved that I realized how close to the edge wealways are when we fly this, and recognize the inherent danger in what we do.It's not routine." But theresults, including scientific research, unexpected spin-offs and pushing theboundaries of human exploration are worth the risk, the astronaut added. "I thinkthat you could wake up in the morning, and until you go to bed at night, andeven while you sleep, wherever you are, you could look at multiple things thatcame out of the space program," Lindsey said. "It impacts everything that wedo." Some spaceexperts believe that, statistically, another spaceflight accident will occur inthe future, forcing NASA or other space agency to once again take a close lookat the processes and the risks involved in human spaceflight. NASA's chief alsosaid that the progress of human spaceflight will likely suffer painfulsetbacks, much like the early air industry, adding that the lessons learned fromeach experience will lead to safer craft. "I knowthat in the course of this, there will be other opportunities to learn, andthey will be sober opportunities surrounded with black crepe," Griffin said. "But we will learn in the same way that the nation and the world learned how todo air transport, and it will be difficult." Risk willalways go hand-in-hand with human spaceflight, Lindsey added. "If we wanta completely safe program, then we shouldn't fly at all," the shuttle commandersaid. "Because there's no such thing."